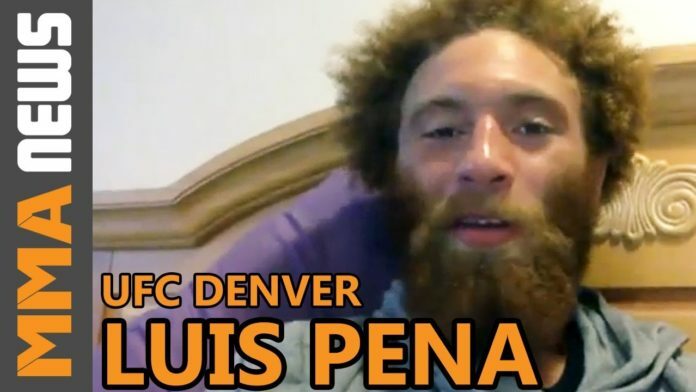 After an injury forced him out of the TUF 27 tournament, Luis Pena never got the chance to prove he was the best lightweight on the reality TV show last season. However on Nov. 10 at UFC Fight Night 139, “Violent Bob Ross” will have another opportunity as he faces TUF 27 lightweight winner Mike Trizano. In preparation for the matchup, Pena had the opportunity to work with the last man to face Trizano, in TUF 27 Finalist Joe Giannetti. According to Pena, the extra help paid dividends in his training camp. Pena (5-0) is coming off an impressive UFC debut where he submitted SBG Ireland’s Richie Smullen in the first round at The Ultimate Fighter 27 Finale in July. The 25-year-old is currently in Colorado Springs training at former UFC fighter Gilbert Smith’s gym leading up to his fight next Saturday. Having a split camp at American Kickboxing Academy and at Victory MMA has prepared Pena for a variety of situations. Despite standing a staggering 6’3 as a lightweight, Pena hinted that we could see him make the move to featherweight after this fight. UFC Fight Night 139 takes place Nov. 10 at Pepsi Center in Denver Colorado and is headlined by the “Korean Zombie” Chan Sung Jung as he meets Yair Rodriguez in a featherweight matchup.